Two years ago, the Houston Astros constructed "Ground Control"—a built-from-scratch online database for the private use of the Astros front office. It is by all accounts a marvel, an easy-to-use interface giving executives instant access to player statistics, video, and communications with other front offices around baseball. All it needs, apparently, is a little better password protection. 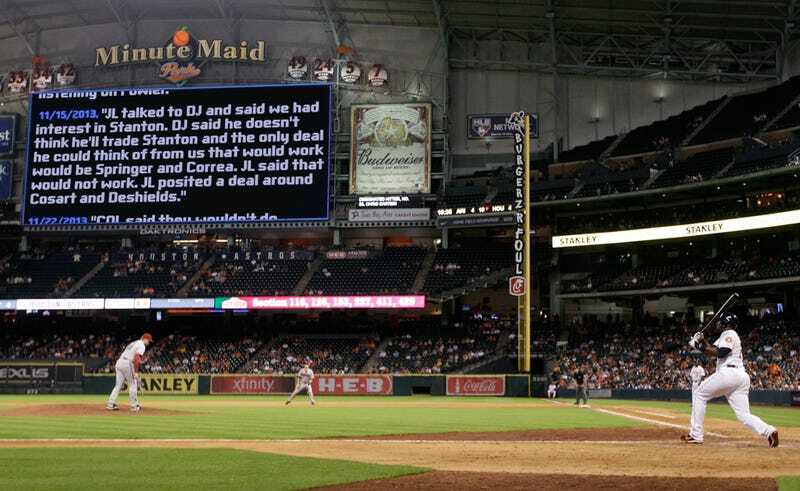 Documents purportedly taken from Ground Control and showing 10 months' worth of the Astros' internal trade chatter have been posted online at Anonbin, a site where users can anonymously share hacked or leaked information. Found below, they contain the Astros front office's communications regarding trade overtures to and from other teams, as well as negotiations—a few of which actually led to trades. You will find heavy efforts to get a big haul for Bud Norris at last year's trade deadline (before settling for very little), pushes to acquire touted young talents like Dylan Bundy and Gregory Polanco, and even evidence the Astros rejected out of hand a blockbuster deal that could have brought them Giancarlo Stanton. While vigorously shopping adequate pitcher Bud Norris last summer, the Astros came off a bit like that one guy in your fantasy league, asking after every team's top young players as if there were a real chance that, say, the Boston Red Sox were going to trade Xander Bogaerts for an okayish No. 3 starter. Nothing ventured, nothing gained and all that, but you wonder if the ultimately unimpressive return they got for Norris from the Baltimore Orioles had to do with them overplaying their hand a bit, especially as the flopsweating Pittsburgh Pirates seem to have been willing to discuss a variety of pretty good prospects. The New York Yankees were apparently willing not only to eat $4.5 million of Ichiro Suzuki's $6.5 million salary, but to sentence Ichiro to spending perhaps his last year in the majors playing in front of empty Houston houses for the worst team in the majors. Poor Ichiro. There's lots more to chew over here; if you see anything particularly interesting, drop it in the comments below. "We had a very bare-bones interface for a while. After the draft, the next critical milestone was the trade deadline, because we knew we were going to be trading players and we knew we wanted to have all our information organized in a way that would help." We have a line in to someone in the Astros organization. We'll update if we hear back, but Jeff Passan has confirmed the authenticity of the documents with multiple MLB execs. Update: The Astros released a statement, and here's Jeff Luhnow's Q&A with reporters. For ease of reading, we've made the entries chronological and filled in MLB executives' full names in place of initials and nicknames. Everything else is untouched. [Giants assistant GM] Bobby Evans called [Houston AGM David Stearns] to check in on Norris. DS told BE that it's probably a little early for us to consider dealign Norris but are always willing to listen. DS said that when we do trade Norris we will likely be looking for quality over quantity. [Orioles GM Dan Duquette] called [Astros GM Jeff Luhnow] and expressed continued interest in Norris. JL said that for us to consider it at this point it would have to revolve around Bundy or Gaussman. DD said no on Gaussman but did not dismiss Bundy out of hand. DD said he ahd to talk to his doctors to really see what was going on. SF indicated to [Luhnow] that they would do Blackburn plus another piece but couldn't include Crick. SF said they could not do Blackburn and Crick but that they would like to keep talking and keep in touch on Norris. PIT reached out to [Luhnow] and expressed interest in Norris. [Blue Jays GM Alex Anthopoulos] texted [Luhnow] and asked what it would take for Norris. AA said Aaron Sanchez is off the table but might be willing to talk about anyone else. [Luhnow] told [Alex Anthopoulos] that we would consider Stroman +. AA said he had a bunch of balls in the air at once but would get back to JL. PIT said the wouldn't trade Taillion or Polanco. Might consider one of Glasnow, Heredia, or Hanson for Norris. [Luhnow] told [Phillies GM Ruben Amaro] that we would consider Aaron Altherr. RA said that seemded like a reasonable ask and he was still evaluating where he was. He would get back to us. [Tigers GM Dave Dombrowski] and [Luhnow] texted. JL said taht we would do Norris = Veras for Castellanos and that we would consider Norris for Jake Thompson. DD said that SP was not a priority for them now but that they would consider those names and get back to us. DET said no to Thompson for Veras. [Luhnow] offered Norris for Blackburn, Mejia, and Mella. SF said no. BOS offered Ryan Lavarnway or Deven Marrero for Norris. We said no. [Luhnow] told [Red Sox GM Ben Cherington] that it would have to be one of Boegarts, Webster, Bradley, or Cecchini to get in the conversation at this point. [Ben Cherington] told [Luhnow] that right now they don't think they would consider those names but will let JL know if that changes. [Pirates GM Neil Huntington] said he would not include Polanco in any Norris deal. [Luhnow] asked for Glasnow + Heredia or Glasnow + Kingham and NH said no. NH said he was willing to add to Heredia. NH said he would also consider adding to Heredia with pick 73. JL said that Glasnow had to be the headliner and we were looking for. [Nationals GM Mike] Rizzo called [Luhnow] to inquire on Harrell. JL told him we would still need a headliner like Giolito because we still value Harrell highly. Rizzo did not respond immediately. [Dan Duquette] checked to see if we saw a Norris deal without Bundy. [Luhnow] said that was unlikely bud we'd be willing to add to Norris to get Bundy. [Neil Huntington] offered Heredia + comp pick for Norris. [Luhnow] said no. [Ben Cherington] texted JL and said they couldn't include Boegarts, Cecchini, Webster, or Bradley but thought they had enough depth to still make an appealing package. JL wrote back and asked if they would consider a package around Barnes and Owens. SF said they still had interest in Norris. [Luhnow] said they would have to include both Blackburn and Mejia to be competitive. SF said they wouldn't include Mejia on top of Blackburn. [Alex Anthopoulos] texted [Luhnow] and asked what a package around Stroman might look like. JL said Stoman + Gose would be in consideration. KC expressed "mild" interest in Jimmy Paredes as an inventory type player. TOR reached out on Jason Catro. They said their No. 1 priority this off season is to upgrade over Arrencibia. They want to get a sense for what the price would be on Castro. [David Stearns] emailed [Royals assistant GM] Dean Taylor asking for either Christian Binford or Julio Pinto. [Rangers GM Jon Daniels] expressed interest in Castro and Singleton, said they were deep at pitching and middle infield. KC said no to Binford or Pinto and responded with Ogando or Diekroeger. We said no. [Stearns] asked for Jack Lopez. I spoke with [White Sox GM Rick Hahn] today. They have definite high interest in Castro. He said they have four untouchable players - Sale, Quintana, Abreu and Garcia. Other than that, they would consider anything. He said they have had some inquiries about Santiago, Reed, Jones, and may consider moving Viciedo. COL is looking for a corner bat (they bid $63 on Abreu), a starter and bullpen help. They want to keep their core together and so would rather address their needs through free agency, but they may be pushed into trading Dexter Fowler. They have received inquiries (KC is one) and aren't ruling it out. [Stearns] spoke to [Royals AGM] Dean Taylor: DT said their first priority is to keep their current SP in place. They would like to bring back Santana and Chen but don't know if that's possible. They expect their payroll to be at $85MM next year. They would also like to add a bat in RF. [Stearns] spoke to [Mets AGM] John Ricco: JR said that they have some pressure to get better next year but have some payroll flexibility to help them do that. They are looking for corner OF help, a veteran starter, and a little bullpen help. Overall they're looking to incrementally upgrade where they can. [Braves AGM John Coppolella] reach out to [Astros director of pro scouting Kevin Goldstein] to ask if we had interest in Paul Janish. [Alex Tamin] told [Stearns] that if we consider trading Barnes this off season we should let them know. They view him as a good reserve OF/depth piece. [Alex Anthopoulos] said Lawrie was untouchable. Sounded like they might consider a smaller deal for Stroman but later in off season. [Rick Hahn] asked [Luhnow] if Hector Santiago would entice us. JL said that was not enough for Castro. RH came back later in the day and asked if Bourjos (from LAA) would entice us in a Castro context? COL told [Luhnow] that they are listening on Fowler. [Luhnow] talked to [Marlins GM Dan Jennings] and said we had interest in Stanton. DJ said he doesn't think he'll trade Stanton and the only deal he could think of from us that would work would be Springer and Correa. JL said that would not work. JL posited a deal around Cosart and Deshields. COL said they wouldn't do Harrell alone but asked if we would add. When [Luhnow] began to press they backed off on Harrell and didn't seem to have real interest. COL said they have multiple offers for Fowler. JL asked if they would be interested in any of our other pitchers. [Luhnow] spoke with [Mariners GM Jack Zduriencik]. Jazk Z said he's getting a lot of calls from Clubs asking him if he can get Castro from us. Jack Z asked if we would do Ackley for Castro. JL said no, we wouldn't do that. Jack Z asked if there was someone he could add to Ackley. JL said he would take a look. [Yankees AGM Billy Eppler] reached out to [Stearns] to see if we had interest in Chris Stewart. COL interest in Harrell has dropped, not a factor at this point. They consider Barnes a nice 4th OF with good defense. They like both Lyles and Oberholtzer and would likely trade Fowler for both, but not for just one. [Athletics GM Billy Beane] offered [Luhnow] Anderson for two of Deshields, Peacock, Stassi. [Padres] want Jackson or Gonzalez, pref in that order. I asked about Oramas and Roach and he said that was too rich. I told him we were looking for affordable pop at 1B and SP and he mentioned Blanks/Guzman/Medica as guys they would consider moving. He also said they possibly have Stultz available. SF reiterated interest in Harrell to [Luhnow]. Also said they would not discuss Belt. MIA said they need a 2B or 3B in exchange for Morrison. Inquired on Altuve and Dominguez. They also expressed interest in Folty, McCullers, and Carlos Perez. [Mets AGM Paul DePodesta] asked Jeff if we would consider Villar in a Murphy deal. [Luhnow] reached out to [Ben Cherington] on Carp. BC said that they likely value Carp more than other Clubs and would likely want real prospect value in return. [Nats GM Mike] Rizzo reached out and expressed interest in Corporan. [Luhnow] indicated we would consider Nate Karns. [Mike Rizzo] said they would not do Karns. [Luhnow] asked [Paul DePodesta] if they woudl consider Davis for Harrell + Sogard. PD said they value Davis higher for that. He said it appears they may value Davis higher than the market does, so they are comfortable hanging on to him. [Luhnow] spoke to [Jon Daniels] said at this point they are not looking to trade Moreland but will keep in mind we have interest. JD said they have interest in Stassi and Marwin Gonzalez if we are looking to move either. Additional analysis by Tim Marchman. Image by Jim Cooke, photo via AP.